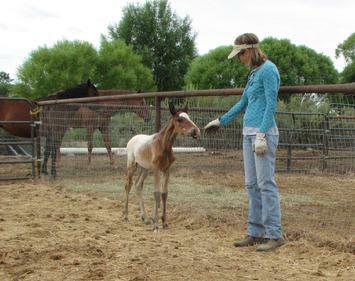 On July 13th volunteers with Four Corners Equine Rescue picked up 3 foals in Kirtland, NM at the request of the NMLB. Starved, sick, and near death, these three babies had been sold at a local flea market after their mothers were sold for slaughter. The three were immediately taken to the nearest veterinary hospital, where they were treated for pneumonia, distemper and severe starvation. With the termperature reaching over 100 degrees, the staff worked hard to keep the babies alive. Slowly they improved and finally were well enough to come to the rescue facility to continue rehabilitation. The little appaloosa colt is named Fonzie, and he's the friendliest of the three. Alphie is the oldest and takes her responsibilities as alpha mare very seriously. 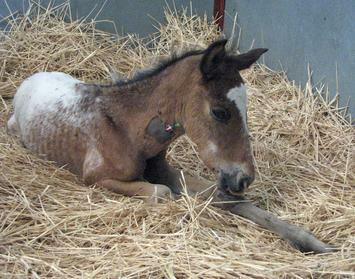 Shamrock, the little sorrell colt is in the worst shape medically, and although he lags beihind the other 2, he continues to improve. 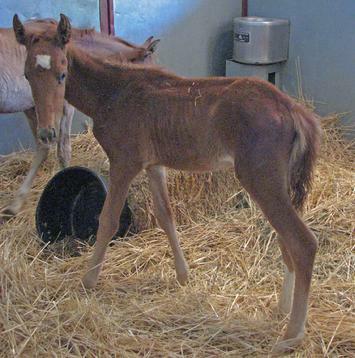 Update - 9-4-10 The foals got their last check up with Dr. Q today. Shamrock has still just a hint of congestion, but with one last antibiotic shot he should be okay. Finally!